Creating a budget is easy – sticking to it is the hard part. Everyone who creates a budget does so with the best intentions. You successfully divide your income into each of your budget’s separate categories and vow to stick to it no matter what. Things come up and life happens, and before you know it, you’ve reached the end of the month and found that you overspent your budget – AGAIN! Slip ups happen and maybe you felt like you just had to buy that new outfit or go out to dinner two extra times with friends. No matter the cause of your overspend, the best thing you can do is make sure it doesn’t become a habit. In order to do that, it’s a good idea to examine the reason behind your overspending. However, those reasons aren’t always obvious. If you’re having a hard time coming up with the answer, consider these 6 reasons that might be the cause of your blown budget. Think about it. How many times have you been at the supermarket or in a store and grabbed something extra just because it’s there? Sometimes, even if you go inside a store with a plan, temptation is hard to resist, and it becomes easy to justify extra purchases. The same thing happens if you shop for groceries hungry, as you’ll likely buy snacks that you don’t need, but look appealing in the moment. Stop and think before you pick up anything extra; take time to evaluate any additional or impulse purchases to decide if it’s something you really need or if it’s within your budget. Furthermore, write down exactly what you need and make a point to stick to your list. Don’t wander throughout the store. Go in, get what you need, and leave so you won’t be tempted to buy miscellaneous items. For most people, the point of having a budget is so they can save up for something in the future. Maybe you’re saving to buy a house or to purchase Christmas gifts for everyone. Unfortunately, as time goes on, it can be easy to forget about your overall goal and give in to the instant gratification of buying something now, not later. A good way to combat the urge to buy now is to place a reminder of your goal somewhere where you’ll always see it. Whether that means taping a picture of it to your fridge, bathroom mirror, or desk, keep something in eye sight so you don’t overspend your budget. Keeping your budget intact involves more than just setting a budget at the beginning of the month. A big part of making sure you don’t overspend your budget is tracking your spending throughout the month. By using apps like Money Dashboard, Mint, or Personal Capital, you can see where every penny of your monthly income is going and figure out where you may be overspending. If you do this throughout the month, you may be able to move money around within your budget categories so you can still stay on or under the bottom line. In the moment, it’s not always easy to decipher between wants and needs. Moreover, if you’re anything like me, you probably do a great job of convincing yourself exactly why you really need something. It’s easy to convince yourself that you need a dress for an up-coming event even though you have five perfectly fine ones at home. Furthermore, consider wants and needs when grocery shopping. Yes, you need ingredients to cook and eat, but you don’t need to spend extra money on junk food and energy drinks. Think about what you really need to buy and ask yourself if it’s something you could live without. If the answer is yes, it’s best to put it back. If you’re convinced you need a certain item, you’ll have to look at your budget and carefully consider what you could sacrifice for it. You might have to give up your weekly night out for a month if you decide you need a new dress. In order to keep from overspending, you have to be willing to sacrifice. Sometimes, the reason for overspending can be that you simply didn’t create the right budget for you and your life. If your budget is extremely strict, you may be setting yourself up for failure in the first place. It can seem impossible to stay within your set guidelines if every small, extraneous purchase puts you over budget. This may even cause you to give up altogether. On the other end of the spectrum, you might find that you’re having a hard time coming up with enough money to cover all your expenses. If this is the case, it’s time to evaluate your lifestyle and cut back on a few things, or find a way to make extra income on the side to support certain expenses. Whether your budget is too tight or too loose, take time to reevaluate how you’ve divvied up your income and adjust it to accommodate your situation better. You’ll find it easier to not overspend if your budget makes sense for your life. Life is unpredictable, which is one of the greatest and worst things about it. Unexpected events and expenses come up, so you might go over budget a month or two in an attempt to accommodate a random expense. If you fail to adjust your budget during this time period, it can leave you feeling overwhelmed. The key is to not be too hard on yourself; there are things you have no control over. All you can do is adapt; push back your goal and maybe cut back in a few areas to make up for the extra expense. 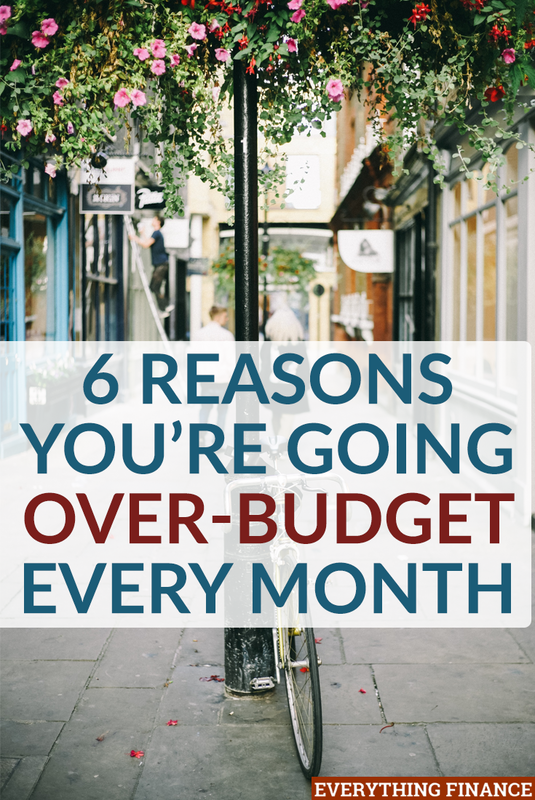 You should also remember that your budget may not be the exact same every month. There are months with special events that you need to include in your budget. It’s okay to have your budget vary from month to month as long as you can still afford the bottom line. Sticking to a budget is hard and there may be a few times that you overspend your budget. It happens to everyone at some point. Sometimes you can’t control it, and other times you can. If you find your overspending becoming a habit, take time to examine your spending and budget to see how you can prevent it in the future. How often do you overspend your budget? What do you usually see as the cause?